Could robots soon be loading your trucks and vans? As talk of autonomous vehicles intesifies, Mercedes-Benz has just invested in leading delivery robot manufacturer Starship Technologies. A Mercedes-Benz Sprinter van acts as the prototype mobile loading and transport hub for eight of the delivery robots. The move by Mercedes-Benz as lead investor underpins its adVANce initiative, based around a 500 million Euro investment over five years to digitalise and automate vans and delivery robots. Mercedes-Benz' role as lead investor for the 16.5 million Euro financing round for Starship follows the 'mothership' concept the two companies introduced last year. Within a year, Mercedes-Benz plans to commence testing the delivery robots in a real-world environment around Europe, as announced at CES 2017 in Las Vegas. A Sprinter van will be used as a prototype mobile loading and transport hub for eight of the delivery robots. If successful, could this spell the beginning of robots used to not only deliver, but load and unload transport goods? Head of Mercedes-Benz Vans Volker Mornhinweg suggests the robot delivery concept could reduce the need for expensive decentralised warehouses. 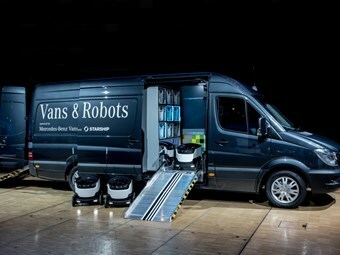 "On the one hand, the introduction of the van as a mobile hub widens the operational radius of the robots significantly, while also rendering superfluous the cost-intensive construction and operation of decentralised warehouses," Mr Mornhinweg said. "At the same time, we make the delivery process much more convenient for the end customer. "For example, the concept makes it much easier to deliver goods to the end customer on time."